Leading Japanese artist Tadashi Kawamata has been invited by Mercer Union to create his first project in Canada – an outdoor public installation to be realized in the centre of downtown Toronto this summer. Concurrent with the completion of this project in early September 1989, the artist will present a 8010 exhibition at Mercer Union combining large-scale maquettes and three-dimensional working drawings with documentation of his previous installations. The site for his outdoor public installation will be located at the Colonial Tavern Park on Yonge Street opposite the Eaton Centre, and focus on the use of intervening space between the two adjacent buildings and an isolated area of ‘parkland’. The project will be developed over a six week period, from late July to early September, opening in conjunction with his exhibition Thursday September 7. exhibition at Mercer Union will continue through Saturday October 7. Kawamata has exhibited throughout Japan, as well as in Paris, Geneva, Venice, Rome, New York City and Kassel West Germany. His most recent project was created for the exhibition The New Urban Landscape at Battery Park in New York City last fall. Kawamata’s works are, for the most part, temporary and created for a particular place and tine. 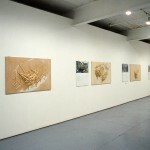 Each work is unique, responding to the architecture, the housing, the social attitudes and the specific cultural concerns of the urban environment in which it is executed. Composed of delicately overlapping layers of roughly hewn and scavenged wood, his three dimensional environments present a metaphor for the constant construction and deconstruction of forms and attitudes in a thriving urban centre. Kawamata’s work, while distinctly Eastern, stands apart from other work being produced in Japan. Through traditionally Western approaches, such as the use of a large scale and a dramatic, aggressive relationship with the viewer and the site, his work creates a tenuous balance between aggression and serenity. It is this balance of Eastern and Western attributes which both attracts and challenges Western audiences. By contrast to their architectural surroundings, Kawamata’s installations are temporal, delicate and almost fragile in appearance. Through broad gestural movements, his forms bridge and integrate several components of each site. Kawamata’s organic forms not only embrace their surroundings, but threaten to subsume the adjacent architecture, subverting its overriding symmetry. The integration of organic forms, movements and natural materials into a rigid geometric space has a humanizing effect on the brick and concrete surroundings. This humanization of de-humanized spaces and the reintegration of the natural into the urban environment form his essential concerns. 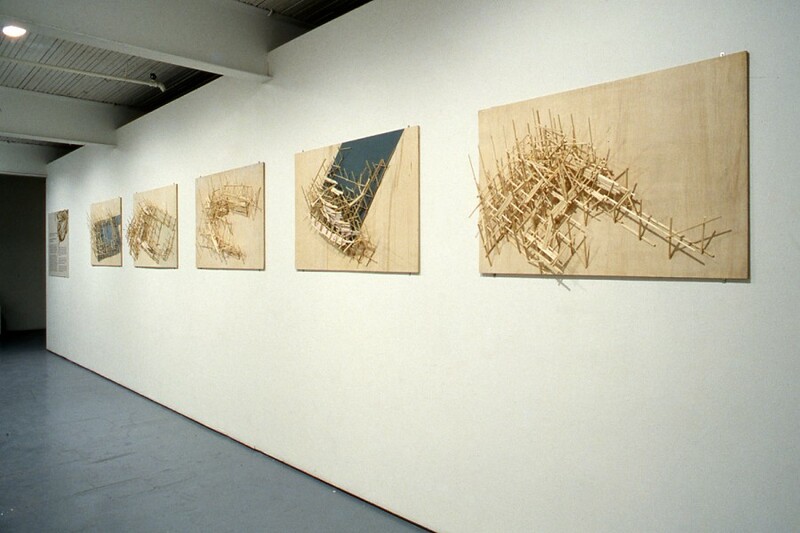 Process is integral to Kawamata’s work. Concerned with the unfolding of the aesthetic challenges posed by the site, he develops his installations through an extensive series of three-dimensional drawings and maquettes. Each preliminary piece examines the linear and spatial properties of the designated site, and aids in exposing the artistic and structural possibilities. A major component of his exhibition at Mercer Union will consist of these preliminary works. The project and the exhibition at Mercer Union will serve as a focal point for a national lecture series by the artist and a context for exchange with the local community. The project will also be complemented by a publication offering critical essays on the artist’s work and documentation of this piece produced in Toronto. The publication will be available in the late fall of l989. 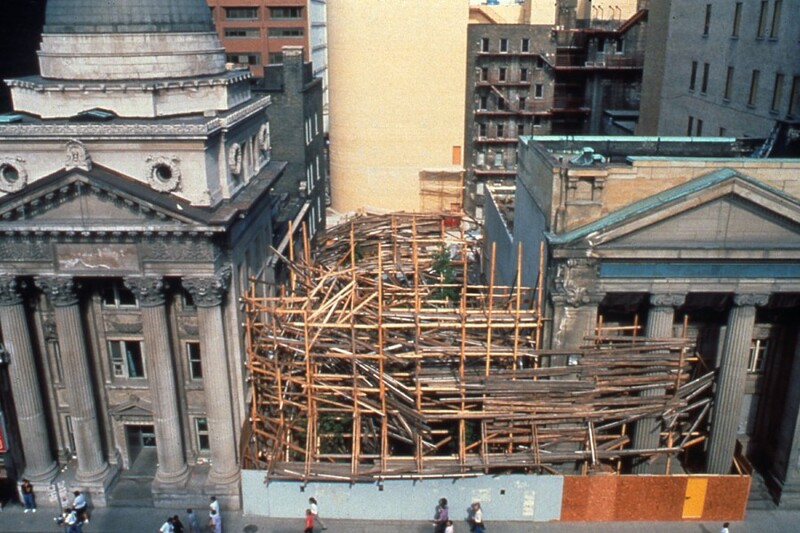 The Toronto Project 1989 will be one of Kawamata’s most dynamic works as the chosen site, the Colonial Tavern Park, is one of strong contrasts. As architect and writer Detlef Mertins has written: Caught for a frozen moment inside his tornado of timber splinters, the usual decorum and distinctions that separate art, architecture, vernacular building and popular culture collapse and are replaced by an enthralling field of ambiguous appearances, dynamic forces and shadowy recollections. …I want to capture a more historical or economic situation in the space where I work and make a project. For example, I always give information about the site, it’s history, the neighbourhood surrounding it and the economic situation they have in the city. When Japanese sculptor Tadashi Kawamata was first invited to Toronto by Mercer Union, he said that from his vantage point in New York, he really had no specific ideas about Canada except that he thought ”(Toronto) would be full of wood.” Growing up in Japan with tourist images of rain forests of the West Coast and the spectacle of Banff, the cool, high-tech reality of Toronto radically altered his conception of this city. As an artist who works within tight parameters of medium and approach, these continuums have altered little for his Toronto project. 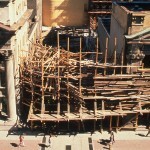 Instead, Kawamata’s installation at the Colonial Tavern Park on Yonge Street is a model of the artist’s finest work, integrating the architecture surrounding the site, the busy downtown retail neighbourhood, the citizens of Toronto who interact with it, and the collaboration of the individuals who laboured on the project. Part of the small group of internationally recognized sculptors, he exists as a modern nomad, moving from project to project in cities around the world. It is this existence which in part Kawamata has chosen and the art world has chosen for him, which informs his work. Still, Kawamata is unique in a pursuit dominated by individuals who create ‘monuments’. The temporality of his work is striking. In Toronto, the artist and a team of six workers began construction six weeks prior to its September opening. The installation will remain in place one month before it is removed. When people enter they will ask if something is being built up here or if it is being taken down. In the beginning the site is empty, now there is some sort of structure there, and then it will be empty again. The structure is not like the other buildings but more like a construction site. (Kawamata) I see what I do as visual terrorism. I always make site-specific work that is temporal. It is related to the idea of the human consumption of time, the site and people. It is like a closed system of entropy. I always pick up material because it is part of closed systems. The material used to be part of a building and then is built up again. It’s like a snake that eats its own tail. Another element is the physical relationship with the people who worked there and a physical relationship with the site and time. I don’t want to use big machines, we always use people to build it up. Collaboration is important. (Kawamata) If I make a big structure with physicality it is a good material. The best material; easy to handle, to make a joint, and work in big scale. It’s also very cheap compared with stone or steel. If I used steel I would need a machine to carry it up or down or a torch to cut it, and wood is like the skin of the human body. It’s not too heavy, but a bit heavy. I feel it is very fit for my structures and it’s easy to pick up on the street or anywhere. So for me, it is an economic concern. He continues to explain how this has been directly used on past projects such as the indoor/outdoor installation created for The New Urban Landscape exhibition at Battery Park, in New York City, in 1988. (Kawamata) I was thinking about Battery Park as one of the biggest artificial grounds in New York City, where they are always trying to create a natural situation by adding trees and things. It really is artificial although it has huge Post-Modern buildings with an art artificial identity. I just wanted to make a poor or primitive structure in that place. The material just came from the construction site. Three weeks before the building opened, I gathered it from the construction site. They were trying to make a big Post-Modern building and I used some garbage from the buildings. It’s the opposite way of thinking. (Kawamata) I don’t want to use a park or a natural situation, I just want to use the city where there are neighbourhood issues…. (In Toronto) I found some sites where both buildings were very high on either side but they were uninteresting. I always pay attention to the atmosphere of the place. For me, Yonge Street is a familiar space when I walk into it. I feel a bit strange about the condition of the site in Toronto, because the opposite side is a big shopping centre with people coming in and out. There is so much ‘building’, but on the other side is very historical buildings, in the middle is nothing and the back side is under construction. There is such a big contrast especially with two historical buildings on either side. What is possibly most striking to the passive observer is the oppositions in Kawamata’s work. While his structures are based on solid engineering in order to keep them upright, the wood which forms the thickly layered platforms rising above the ground seems precariously arranged. In stark conflict with the surroundings, he creates for us an encounter which is primitive and anti-orderly. (Kawamata) I was born in the city and live in the city. This is a reaction. People are so paranoid that I have to keep my identity or I would have the same way of thinking. All my ideas were formed by my experiences in Tokyo. There, so many people live together and its look quickly changes. People work 24 hours. There are so many strange people and ideas about work and economics. It’s very complicated and computerized. It’s full of information that is all mixed up. The city is so programmed but still controlled. This is really interesting for me to think about questions like ‘What is art and what can I do in this place?’, because Tokyo is a model of a futuristic city as are the people who live in that kind of city. (Kawamata) …I wanted to work in a more public situation, but still privately. The thinking would be very private and the location would be very public. That’s very healthy for me. When I work in a public situation there is an audience coming through, to look and talk to me. This is very healthy, but the thinking is very private and I need a few people to help me with ideas about the project. Not physically, but to take suggestions from me and to ask me questions. It is a relationship, not only artist to audience but people to people, and to the neighbourhood with people giving me information. When I make a big project in an outdoor place, it is still private to me. I work with assistants but they are only a few in number and we always discuss how to construct it and do particular things. Its like a collaboration. When thinking about Kawamata’s outdoor projects, the notion of a dwellings or defined spaces repeatedly comes to mind. In the case of the Toronto project, pedestrians can actually enter and walk around it. Similarly, the Battery Park project was a very contained enclosure. This continual transition from the out side to the inside, or call it the external to the internal is a large part of our experience with the work. Not only does the Toronto project function for us on an experiential level, but the visual dichotomy of the interior structure projecting out onto Yonge Street and the exterior layers which engulf the viewer within the site serve to de-hierarchize the space. (Kawamata) I think about inside and outside and how those spaces fit into a grid or category. For me, inside and outside are the same. The human body is the same. I think this applies to space as well. We think about inside the country or outside of the country. The same applies to ‘identity’. I don’t want to make an inside position or outside position of space, public.or private, artists or public audience. This is an idea about hierarchy. Kawamata’s desire to resist the straight and perpendicular is part of a sustained attack against the order of society. He likens it to a grid in which the members of society may function although never change the grid itself. It is a closed system. By refusing to conform to the categorizations of Art or Architecture he is attempting to shift this balance of power temporarily. (Kawamata) My projects are a metaphor for my philosophy which is not only against architecture or art or a city, but against categorized and culturally enclosed situations and the political power structure which we already have. I want to develop a new way of thinking about this. Kawamata approaches each construction in a quiet, subversive manner. He is planting a small seed of visual unrest that allows us to ask ‘Who can allow this to happen?’ and ‘What is going to happen next?’. Our notion of authority creating order is shaken. We have been taken over by anarchy. The carpenter has seized control. (Kawamata) I see what I do as visual terrorism. Normally in a city we are always trying to reduce intrusive noise. My construction is like that noise. Not politically aggressive, it’s just visual terrorism. I make a noise but its meaning is just like a big Happening. I create something that is in a different order. Because the city is based on a very tight structure, the artist must always make something to resist it. Tadashi Kawamata’s works are temporary and site-specific, responding to the architecture, social attitudes and the specific cultural concerns of their urban environment. His works are metaphors for the constant construction and deconstruction of forms and attitudes in urban centres. 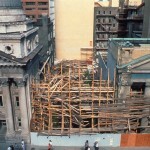 With the Toronto project, a steady stream of downtown pedestrians observed the application of thousands of pieces of wood to a skeletal support structure over a four-month period and then witnessed the sudden removal of what few realized was a finished work of art. The process then was an element integral to the work. It changed physically and followed its own evolutionary path in response to the ideas and reactions of its audience. In the end, Kawamata’s work questioned whether memory is in fact more vivid than perception. I began the process of bringing Kawamata to Toronto after viewing his work Destroyed Church at Documenta 8 (1987) in Kassel, Germany. Initiating communications with Kawamata was difficult as he is a nomadic artist, traveling from country to country. After several months of tracking his movements and relaying messages through curators and directors in various countries, I received a response: Kawamata would indeed be interested in discussing a project for the city of Toronto. During the building of his work for the exhibition The New Urban Landscape at Battery Park in New York City, in September 1988, Kawamata and I discussed the potential scope of a project for Toronto. One month later, Kawamata arrived in Toronto to scout out possible venues for the project and to gain insight to the city’s urban personalities. Following his initial visit, the artist proposed two projects within the downtown area. His attraction for each site ranged from the philosophical and conceptual inferences of the location to the practical and aesthetic qualities of the surrounding buildings. Colonial Tavern Park was the final site chosen – a small open space that Adele Freedman referred to in the Globe and Mail as “a ghost floating between two neo-classical shells.” Located opposite Toronto’s largest shopping complex, the Eaton Centre, Colonial Tavern Park allowed for an interaction with a large and potentially the most diverse audience in Toronto. Within nine months of reviewing and accepting his proposal, Kawamata’s most ambitious project to date was realized. with the task of realizing this project. Kawamata’s assistant, Mika Koike, gave limitless amounts of energy, assistance and encouragement through every stage of its development. In addition to those involved in the physical realization of the project, I wish to thank those who contributed their knowledge, insight, and critical voice. Primary among these individuals are: Detlef Mertins, for his essay addressing Kawamata’s project from a historical, architectural and theoretical viewpoint; Linda Genereux, for her insightful interview with the artist; and Rosemary Donegan, for her historical research into the site and the changing times of the Colonial Tavern. 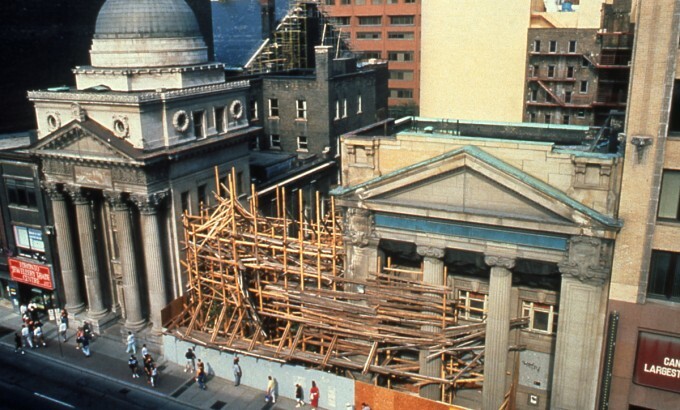 Without the generosity of sponsors, the Kawamata: Toronto Project 1989 could not have been realized. The contributions made by Morden Yolles and Rolly Bergman of M.S.Yolles and Partners, Consulting Structural Engineers provided, literally, the foundation upon which the project was based. As well, the assistance provided by Teperman and Sons, Inc. allowed the physical development and construction of the project. As sponsors of the gallery exhibition, Kuwabara Payne McKenna Blumberg Architects enabled the project to expand significantly in nature, presenting a historical and international context through the maquettes, drawings and photographs of previous projects. Although a project of this magnitude requires the tireless efforts of a great many individuals, there stand apart several who assisted from the initial development stage through to the final removal of the project from the site. Heather Hatch, as the contact at City Hall, lent her energy, resources and organizational skills as the guiding light through the maze of process and procedure. As well, the staff of Mercer Union and the project assistants demonstrated their commitment and determination throughout the long process of developing the project: Carolyn Bell Farrell, Reid Diamond, Rebecca Diederichs, Gary Evans, Martha Hodgson, Lucas Liepins, Mary Purdon, David Warren, Doug Whitton and Robert Windrum. I would also like to thank Micah Lexier for contributing his design sensibility to all the project’s printed material and for the many hours of hard work spent on the production of this catalogue. Additional financial support for the project was generously provided by the Ontario Arts Council, Canada Council, Consulate General of Japan, City of Toronto through the Toronto Arts Council, Public Art Commission, Parks and Recreation Department and the City Property Department, as well as the Ontario Government through the Ministry of Culture and Communications. September 16, 1988: Exhibition at Battery Park, New York, New York: The New Urban Landscape; Steven Pozel and Kawamata have initial meeting to discuss potential for a Toronto project. October 16 to 19, 1988: Kawamata visits Toronto to select possible sites for Toronto project. January 13, 1989: Two proposals received in Toronto from Tokyo; Colonial Tavern Park selected as project site. April 2 to 5, 1989: Kawamata returns to Toronto to discuss project for Colonial Tavern Park with engineers, City of Toronto representatives, project assistants, writers, gallery staff. May 24, 1989: Exchange of structural drawings initiated by M.S.Yolles and Partners, Ltd. Kawamata develops supporting structure while in Paris, France; plans and changes exchanged by fax. 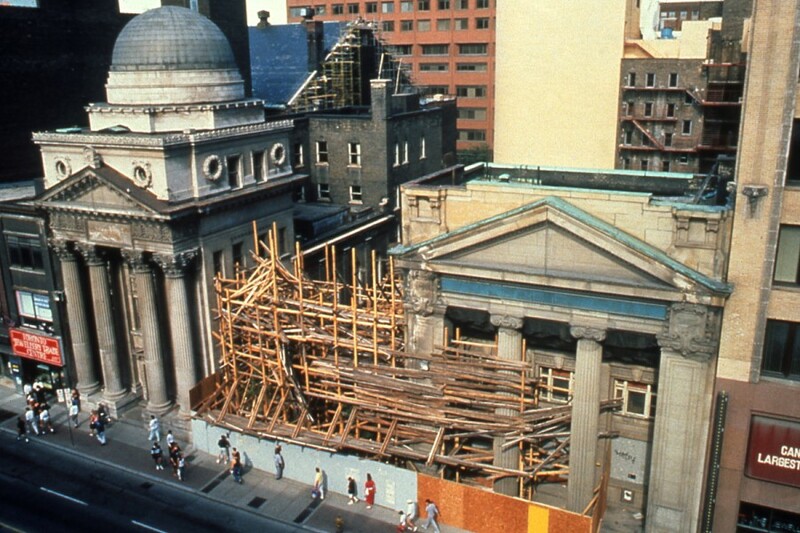 June 11, 1989: Wood donation secured from Teperman and Sons, Inc.
June 29, 1989: Toronto City Council approves proposal for Colonial Tavern Park. 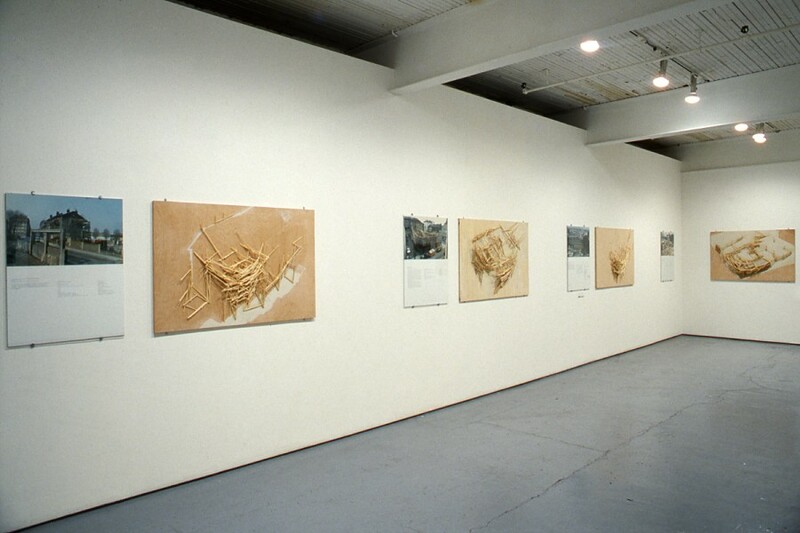 July 2, 1989: Kawamata and Steven Pozel meet in New York to finalize details of project and accompanying gallery exhibition of models, drawings and maquettes from previous projects. July 5, 1989: Kawamata and assistant, Mika Koike, arrive in Toronto to begin the Toronto project. July 7, 1989: First meeting with crew and engineers of M.S.Yolles and Partners at site. July 18, 1989: Wood delivered to site by Teperman and Sons, Inc.; maquettes and drawings arrive at Mercer Union from New York City. July 24 to August 5, 1989: Core structure completed with assistance from M.S Yolles and Partners. August 5 to September 2, 1989: Project constructed and completed. September 6, 1989: Opening reception for Yonge Street site. September 7, 1989: Opening reception for Gallery exhibition. 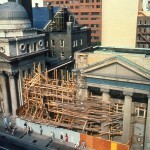 September 8, 1989: Kawamata departs from Toronto for project in Belgium. October 7, 1989: Gallery exhibition closes. October 8 to 14,1989: Demolition of structure at Colonial Tavern Park by Teperman and Sons, Inc.
Tadashi Kawamata’s outdoor installation at Documenta 8, with its stylized wooden scaffolding built in and around the bombed out ruins of a Kassel church, made an impressive and poignant war monument. Its splintered boards and unsteady, ramshackle appearance recaptured a sense of one single, terrible moment of collapse under Allied bombing. The piece became a pathway back to that 45-year-old experience, underscoring the lingering impress of the war and its physical and emotional devastation. It took advantage of its own access to 20th-century history and to one of the sites of that history’s making. Such historically impacted sites aren’t always available, and Kawamata’s new Toronto Project, 1989, raises the issue of what happens when contextually dependent work like his must make do with a more modestly signifying site. Certainly the artist shows no lack of energy in trying to maintain the scale of meaning. Site in Kawamata’s work is always augmented by construction, and it is the relationship between the two, between the site and the artist’s own tense, animated scaffolding, that is at the heart of the work. In Kassel, the deconstructive aspect of the scaffolding had a tragic dimension; in Toronto, the same look seemed artificial. This was partly an appropriate reaction to the installation’s locale, a park across from one of the main downtown shopping malls. The 50-by-105-foot lot used to be the site of a well-known jazz club. Now it is a green void, with benches between two turn of-the century architectural landmarks (both bank buildings), one of them built according to a domed Roman model, the other to a Greek Revival one. 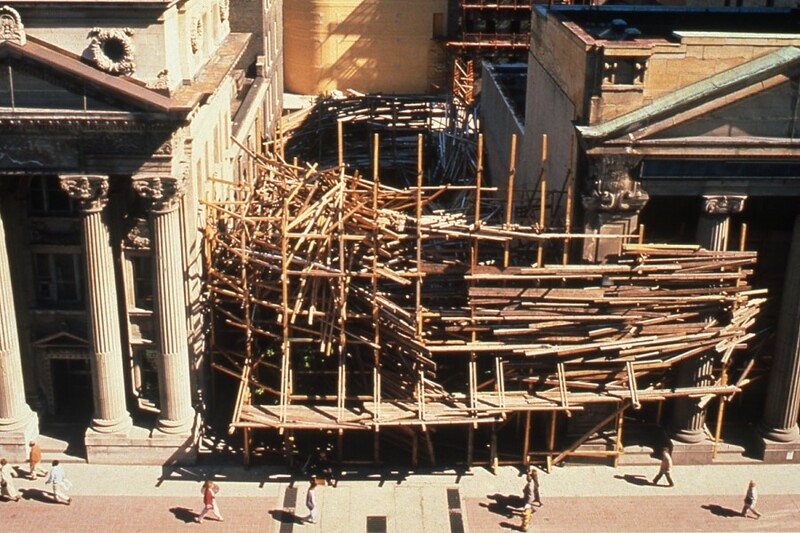 Kawamata’s swirling lumber construction broadly contextualizes the site. The street frontage portion of the piece mimics that of the many construction sites in downtown Toronto, while the upper framework recalls the support structures of some nearby advertising billboards. Together, these elements denote an ironic, wary relationship with the commercial forces of urban redevelopment. Kawamata’s piece is a token reaction to a bland and endless modernity. But the work also strains for a grander emotional impact. Sited between the two older buildings, it implicitly serves as a marker for loss – the loss of what, in context, registers as higher standards, better care, deeper vision. But given the slim attention these neighbouring buildings pay to anything other than their own facades–this is a longstanding tradition of Toronto architecture – the presumption of a clear cut notion of cultural loss is questionable. Before its demolition, the jazz club had degenerated into a lunchtime strip joint; the sense of loss, then, is both imaginary and polemical. The conceptual drift of the installation is largely nostalgic. It laudably frames urban development as an art issue and as a civic issue, but the expressive, fragile, broken, uplifting structure employs a stereotypically romantic vocabulary. It proffers only a generic spiritualisation and seems a symptom of the urban malaise it tries to picture. It also reveals the outline of a messier, less understood context, in which a comfortable, taste-proud generation has learned to tell itself subtly insulated stories about cultural distress. This summer, the internationally renowned Japanese artist Tadashi Kawamata will create an outdoor installation in Canada. Co-ordinated by Steven Pozel, director of Mercer Union, the project will involve the emotion of a large work in the Colonial Tavern Park on Toronto’s Yonge Street. The installation, Kawamata’s first in Canada, is expected to be finished by early September, in time for the opening (Sept. 7) – a show of the artist’s maquettes and drawings at Mercer Union. Kawamata came to international attention as a participant in the 1987 Documenta exhibition in West Germany. 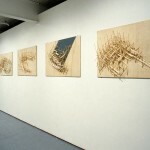 He has also fabricated his large, surging environments of overlapping planks and wood scraps in Japan, New York and in several European capitals.